If you are looking for a Toronto event venue downtown to hold your next event, here is maybe a space you haven’t thought about yet. 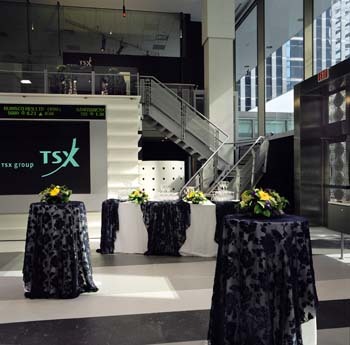 The Toronto Stock Exchange offers event facilities for rental within the heart of Toronto’s financial district with accessibility to PATH, and Toronto public transit. You will have the possibility to rent the Gallery and/or the Studio which is more for intimate events such as small luncheons. 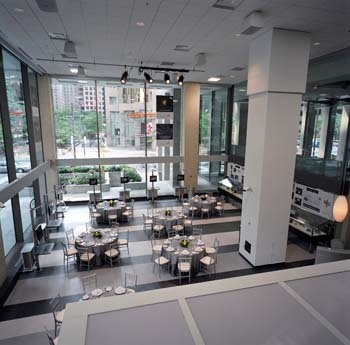 These spaces are popular for listed companies or other business to business events. 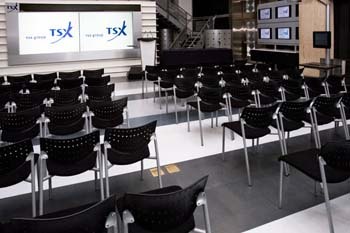 The TMX Broadcast Centre Gallery has a capacity of 100 theatre style, 72 in full rounds, 64 classroom or 200 reception. The room rental rate has all-inclusive technology which means you will enjoy in-house screens, projectors, mics, risers, podium, audio recording and more available at no additional charge. A technician from the TSX will work with your company throughout the event and a security guard is mandatory for event rentals. Many use the space as a perfect location for broadcasting. Besides, the upper level mezzanine is also available for use at no extra cost, and this can be set up as a satellite kitchen, if the caterers are doing hot passed hors d’oeuvres, or as a lounge, with a bar and furniture.